Lake Mungo can be found in the western part of the State of New South Wales. The lake is part of the Lake Mungo National Park. The very name of this dry lake bed conjures up images of mystery and intrigue. Since 1969 it has become a magnet for archaeologists and tourists alike. Lake Mungo is one of seventeen lakes that forms part of the UNESCO World Heritage listed Willandra Lakes Region. Australia is an ancient land and Lake Mungo holds the secrets of the earliest Australians. This is where the bones of ancient aboriginal civilisation were discovered. First among them were the scant remains of Mungo Woman. Her remains have been shown by carbon dating to be aged somewhere in the vicinity of 25,000 years old. The remains proved that she had been cremated, which indicated ritual and respect for the deceased. Mungo Woman has the honour of being the oldest cremated person to be found anywhere in the world. Whilst the amazing discovery of Mungo Woman generated a great deal of excitement in archaeological and anthropological circles, and also the media her discovery was soon to be eclipsed when Mungo Man was discovered. Although many people would assume that Mungo Man and Mungo Woman may have been close in life, it was initially thought that this is impossible, as the remains of Mungo Man pre-date his female companion by at least 15,000 years. Amazingly, the remains of Mungo Man are at least 40,000 years and possibly more than 60,000 years old. Scientists are now of the general opinion that Mungo Man and Mungo Woman are about 40,000 years old. 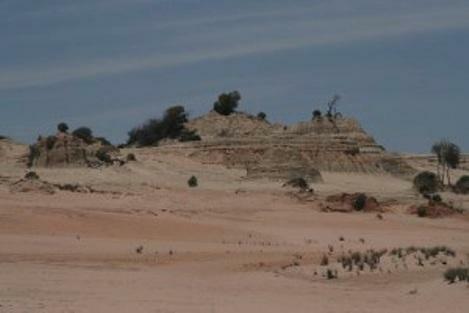 Although the Lake is now dry, evidence shows that before the last Ice Age, Lake Mungo was filled with water. Fragments of stone and tools showed that the inhabitants of this area were tool makers. And other evidence showed that they enjoyed a diet of fresh water food from the lake. This area was a sheep station dating from the early 1800s up until the mid 20th century. 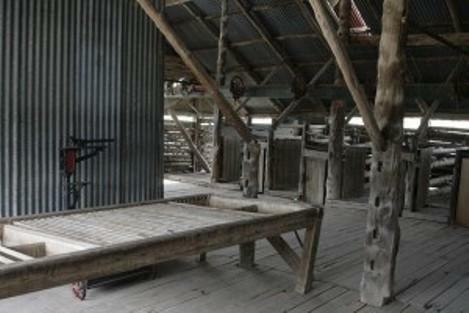 The old wool shed is preserved as part of the National Park exhibit. The lake itself dried up about 14,000 years ago and is now covered by low scrubby vegetation such as salt bush. 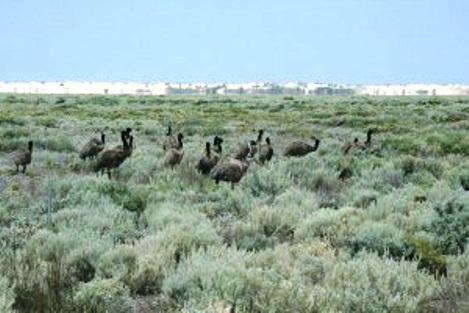 Emus abound on the plain that was once 8 metres deep in water. There is also the odd red kangaroo and too many rabbits. On the eastern side of the lake is a sand dune called the Walls of China. It is moving eastward at the rate of 3 metres per year. In the moonlight, I am told, it takes on an eerie glow, as if on another planet. Lake Mungo lies about 130 km north east of the town of Wentworth, which sits on the convergence of the Murray and Darling Rivers, the spot where Australia’s two longest rivers meet.